$499 DOWN Guaranteed Approval!!! This Payless Certified Pre-Owned 2017 Mitsubishi Mirage G4 has been thoroughly inspected and reconditioned before you buy it. When you pull it off the lot youll enjoy even greater peace of mind knowing that it has at least 12mths/12,000 miles of powertrain warranty, has been fully serviced and qualifies for rates as low as 3.99% and many other benefits. Contact Payless Car Sales for a full list of benefits. Everyone hates the gas pump. Skip a few gas stations with this super fuel efficient MitsubishiMirage G4. When all factors are equal, choose a vehicle equipped with a factory warranty like this gently driven gem. Pre-owned doesn't have to mean "used." The clean interior of this Mitsubishi Mirage G4 makes it one of the nicest you'll find. More information about the 2017 Mitsubishi Mirage G4: If your idea of basic transportation is a no-frills economy car with five doors, a 10-year/100,000-mile warranty, the best non-hybrid fuel economy on the market, a base price under $13,000, and a fun color palette, then look no further than the Mitsubishi Mirage. With its diminutive size, the Mirage is quite nimble, allowing for excellent maneuverability in tight spaces. It also comes with a surprising array of tech options that include Android Auto and Apple Car Play. The Mirage may not win many drag races, but it will get everywhere it needs to go, and it will save money the whole way. 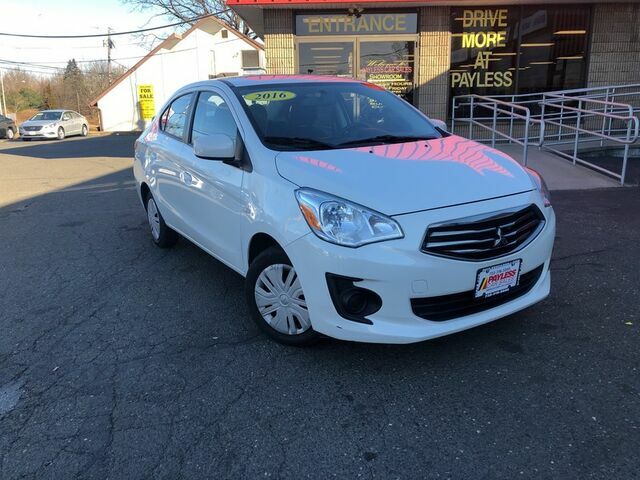 Strengths of this model include Excellent fuel economy, strong standard tech features, agile handling and maneuverability, terrific warranty, and low starting price Call now (732) 316-5555 This one won't last! Whether you have good credit, bad credit, no credit or even in a bankruptcy or repossession we can help. Our goal is 100% guaranteed approval!! Call us at 732-316-5555 or come on in to our South Amboy, New Jersey showroom and one of our credit specialists will help you get the vehicle you deserve at a payment you can afford. The advertised price does not include sales tax, title, DMV fees, finance charges, prep fee and documentation charge of $289. All financing subject to lender approval, rates and terms may vary. Any payments listed are an example and not an offer or guarantee or terms and are subject to lender assessment of credit,down payment and term. Prices subject to change at any time. While every reasonable effort is made to ensure the accuracy of this information, we are not responsible for any errors or omissions contained on these pages. Please verify any information in question with your sales representative.